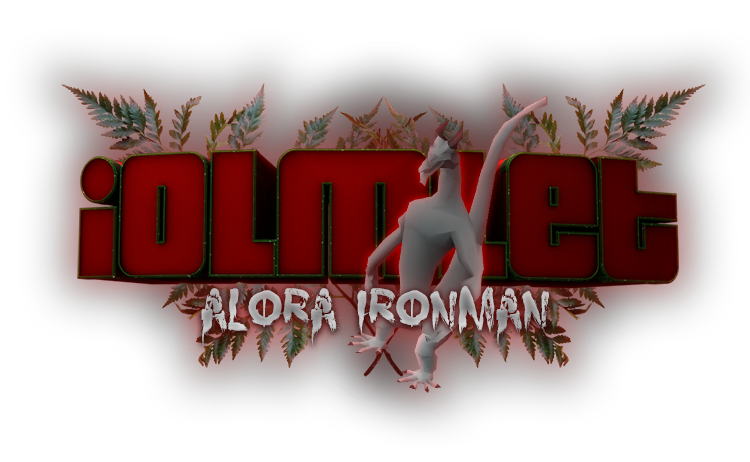 Alora Newspaper 12/31/2018 - Official Newspaper - Alora RSPS - The Best Old School RuneScape Private Server! This will be the last newspaper of 2018! Happy New Years to everyone! Rule 14 has had a slight change. Today’s update brings the first part of our Holiday updates, including a 30% bonus token sale, the elusive Santa suit being available in the store, and, of course, the arrival of snow on Alora! Keep an eye out for a Christmas giveaway with IRL prizes to be won, as well as an in-game Christmas event. Aside from the festivities, this update brings the content that you voted for in the recent polls, the Classic mode changes and the clean slate for 3rd age equipment. This should bring value to the 3rd age economy, as those items will be much more rare from here on out. We’ve reimbursed the current holders of 3rd age equipment by giving them caskets to open based on the rarity of their equipment. Lastly, we’ve implemented some changes to Last Man Standing to hopefully keep it active and worth playing. Firstly, every 3 games, a free (casual) match will be announced. Additionally, a point system has been added, with a reward shop which you can access by speaking to Lisa. Lastly, the Leaderboard next to the LMS lobby is now functional. Aside from this, we’ve also included a few bug fixes and QOL updates! For a limited time, all store purchases will receive 30% bonus tokens! Make sure to take advantage of this sale from today all the way through to December 27th, 2018. The Santa outfit has been added to the shop for a limited time. This outfit, which is now tradable, can be purchased for 2,500 tokens. Due to popular request, we’re making some changes to the Classic game mode to hopefully revitalize it and to make it appeal to more players. As many of you know, the release of Elite Ironman lessened the Classic population, with many people preferring to play with a single partner rather than to be part of the Classic economy. How are we changing the Classic game mode? We’re opening the economy of Classic mode, and making it so that you can trade with normal players, use the normal Trading post, use the Donation store, etc. The current Classic economy is not large enough to sustain itself, and with these changes, we’re hoping that this becomes a game mode very similar to the Normal game mode, but with the same low XP rates that many of you prefer to play on. There isn’t currently a low XP rate “normal” game mode, so we’re hoping that Classic can fill this role, and that we can breathe a new life into the game mode. Classic can now trade with normal players, use the Normal trading post, and use the normal donation store. 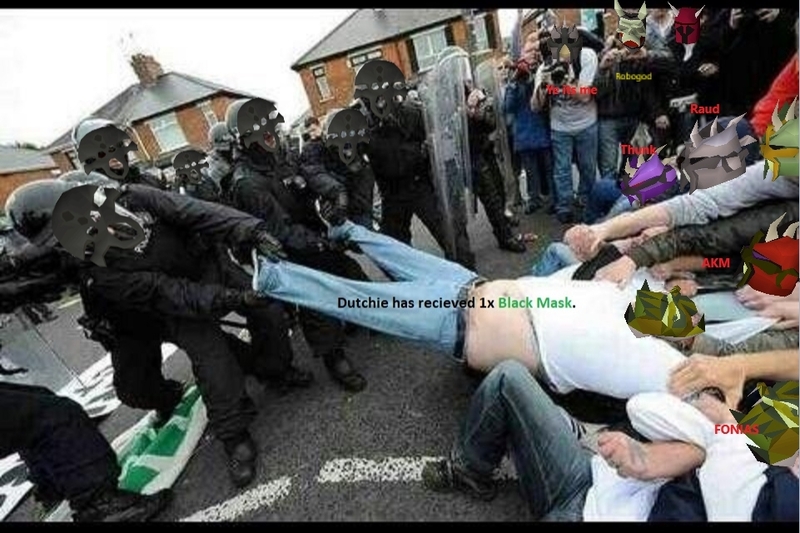 They can also now PK other players and pick up their loot. Any items on the Classic trading post have now been merged to the normal trading post. Classics will now receive the same amount of GP from NPC drops, money caskets, thieving, etc. as normal players. Classics now have a new sword that they can wear to show off their status, the Classic sword (Prop sword on OSRS). This sword is solely cosmetic. Classics can now use normal shops. Well of goodwill contributions are no longer doubled for Classics. This cosmetic sword is an item that only Classic mode players may possess, and signifies their rank without them having to say a word. You can collect this sword for free from Paul at home. New Classic players will receive this sword after their starter tutorial. Clue scrolls are now slightly less common across the board. Clue bottles from fishing are now slightly less common. Clue scrolls from Bird’s nests are now slightly less common. Your clue scroll completion counter now goes up as soon as you receive a casket, not as soon as you open it. This is due to the fact that many caskets were just added into the game (see below), and we don’t want those to affect clue completion counts. Clue scroll caskets will now announce when a player receives a Clue hunter piece or a 3rd age item. Impling jars will now announce when somebody obtains a 3rd age item. 3rd age is now extremely rare from Clue scrolls and Lucky implying jars. 3rd age armour has been removed from the game. 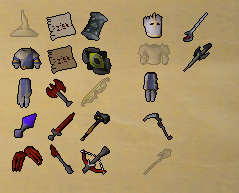 Anyone who previously had any gear will receive a clue scroll casket depending on the type of 3rd age piece. As 3rd age is much more rare now, it will be difficult to receive another piece, but it gives current holders a chance. The only exceptions are the 3rd age hatchet and pickaxe, which are currently custom items. Snow has covered Alora! You can disable the snow by typing ::snow. Bolt special attacks now have a 10% higher chance of activating if you have completed all achievements. This is typically a perk that is obtained with the Kandarin diary on OSRS, though this not available on Alora so we have swapped it for achievement completion. A tip message has been added in-game to notify players of this perk. Both are no longer ‘instant’, and after receiving the “You have been poisoned!” message, the damage will appear after a few seconds rather than immediately. The Toxic staff of the dead and Trident of the swamp can no longer apply Venom with melee attacks, only through Magic. Venomous weapon = 25% chance. When dying to venom, there was a chance your items on the ground would not last as long. This has been fixed. Many items’ exchange prices have been fixed, they will now represent the price more accurately. This is calculated by data collected over the past few months from the Trading Post history. The ‘Craft 500 Wrath runes’ daily task actually only required 300. This has been fixed. Baby implings will now give Pure essence rather than regular essence. The Clown costume has been fixed and no longer says ’Null’. When attempting to click the “Show XP drops” button, the bugged “Look North” button would overlap it. This will no longer happen, and both button boundaries have been fixed. February 2018 PvM Cup winners added to the Cup in Edgevile. Santa outfit is now tradable. The Chaos Altars in level 12 and level 38 Wilderness will no longer allow you to switch your spell book, and will only recharge your prayer instead. Killtime records were bugged when a player would attack a target with a multi-combat spell (barrage) or attack (eg. Chinchompa ranging) and the surrounding NPCs that are hit would not ‘register’ a start time, leading them to have super short kill times. This should no longer occur, and we’ve had to reset all affected killtimes. This means that a few monster kill times have been wiped, but this does not affect any mini-games such as the Inferno or raids. A leaderboard has been added near the Last Man Standing lobby. 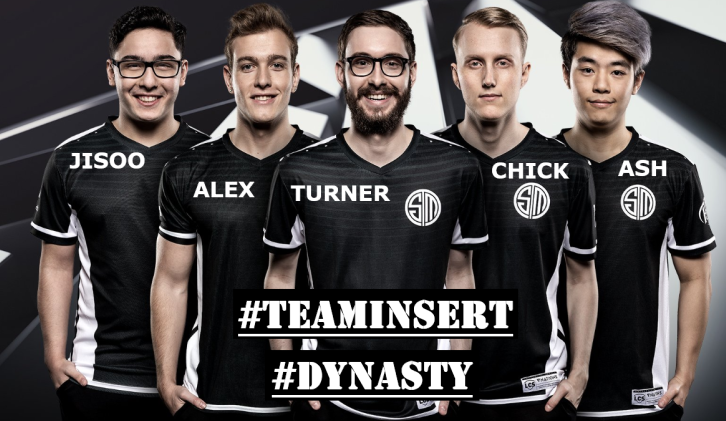 This will list the players with the most LMS wins, as well as the number of games they’ve played and their win ratio. This data is only collected as of this update, so the highscores are clean. Last Man Standing points have been added! This will hopefully keep the game alive and give players incentive to play. This item is a unique cape that can only be obtained from Last Man Standing. This shop and reward system is still being tested and subject to change. If you have any suggestions, please let us know! Every 3 paid games, one free casual match will be held (and announced). You can still receive points and improve your ranking in this casual match. ::checklms command has been added. This command allows you to list how many players are still alive on the island, and their names. The winner of every game will be announced to the world, as well as the amount that they have won (if applicable). Your waiting interface in the lobby will now tell you how many survivors are remaining in the current game. You can now use your items on the Vending shrines to sell them quickly. If you only have 1 of that item, it will instantly sell. If you have multiple items, a dialogue in your chatbox will pop up to ask you how many you’d like to sell. Players getting the error message ‘You cannot join with a pet’ while not having any pet at all has been fixed. Resting in the fog will no longer stall/cancel damage. Christmas is almost here! And on Alora, if you’re not already in the Christmas spirit, you definitely will be with this update. 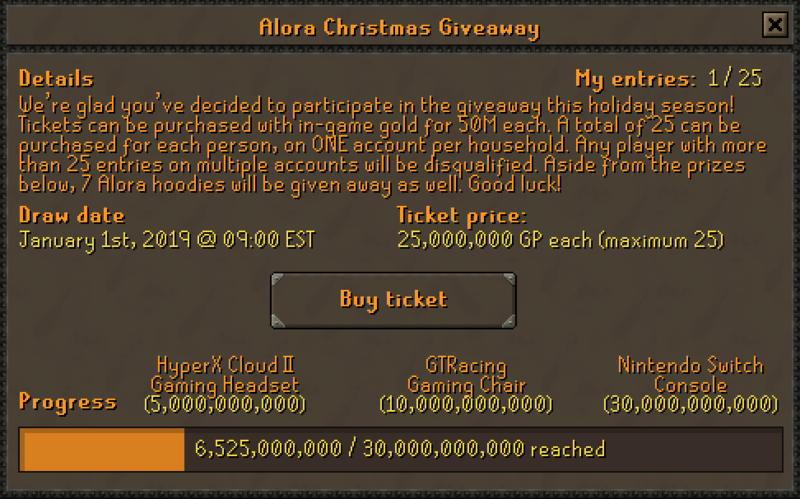 If you were here last year, you’ll remember the Alora Christmas giveaway, and you’ll be happy to hear that it’s back again this year! You’ll be able to purchase tickets for the giveaway for a chance to win 1 of 10 IRL prizes. Additionally, Santa’s in need of some help to deliver presents this Christmas and has some enticing rewards if you’re willing to help him. As our way of getting into the Holiday spirit, and to show our gratitude to all of your continued support over the past 2 years, we’ve decided to host another giveaway with IRL prizes this holiday season! You can enter in-game by purchasing tickets from Haris at home (leaning on Well of Goodwill). Tickets cost 25m GP each, and each player (or household if multiple people play from your house) can only have 25 tickets at most. This is very important, if your name is drawn and we find that you’ve purchased more than 25 tickets on multiple accounts you will be disqualified. The drawing will be on January 1st, 2019 at 09:00 EST. Prizes are unlocked as everyone collectively hits milestones. Guaranteed prizes: 7 different Alora hoodies will be given out! Assuming the full 30b gets donated, there are 10 prizes for 10 players. 3 top prizes listed above, and then the 7 hoodies. Can the same person win multiple items? To make it fair for everyone, if the drawing lands on the same person twice, there will be a re-roll. 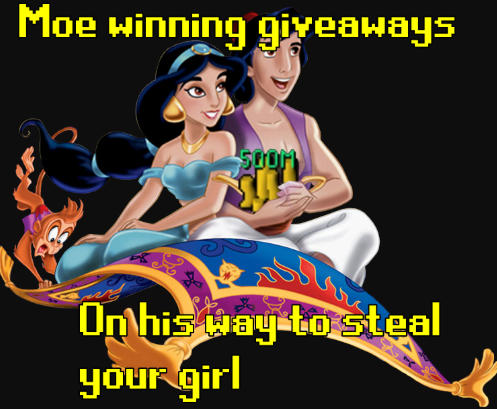 To make this fair, the top 3 prizes will be drawn first, and then the hoodies drawn afterwards. Yes, anyone can enter, including staff. If it reaches 30b for the Nintendo Switch, can the other prizes still be won? Yes, if the 30b is reached, all 3 prizes are rewarded, as well as the 7 sweaters. If only 10b is reached, the first two prizes and the sweaters will be rewarded. What if I win but do not want the prize? You can also take the cash equivalent of the prize(via PayPal), or 1.5x the equivalent in Alora tokens. I have a brother/sister who also plays, can we each enter 25 times? Unfortunately, there is a cap on the number of tickets and it is set at 25 per household. This is to ensure everyone gets a fair chance and that nobody is cheating. We will be looking into the winners to make sure that they fairly purchased their tickets. A random number will be picked, which will correlate to an entry on a list of names. Your name will appear on the list as many times as you’ve purchased tickets, meaning the more tickets you purchase the more likely it is to land on your name. With Christmas approaching, we’ve set up a nice big Christmas tree at home! Additionally, we’ve added falling snow around Edgeville. A heavy snowfall has hit this year, and Santa is in need of some help delivering gifts! 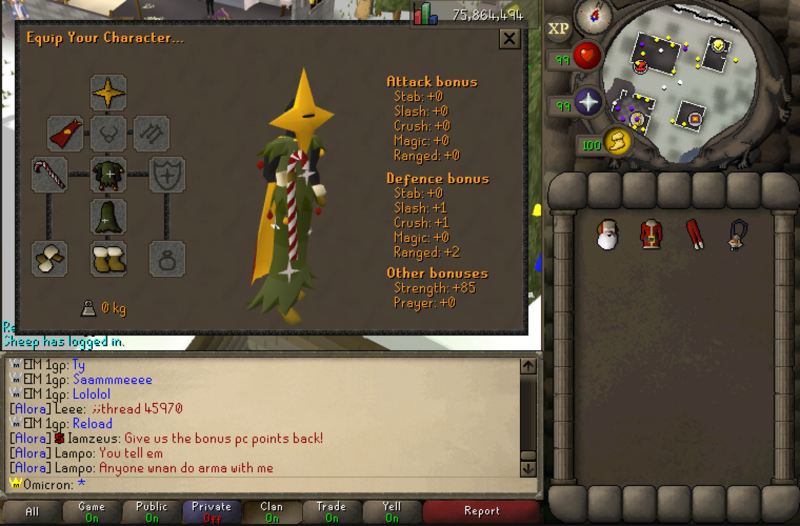 Speak to Santa north-east of Edgeville by the Christmas tree to find out exactly what he needs from you. After aiding Santa with the present deliveries, you’ll be awarded with a few new holiday cosmetics! These items will go to the Lost items manager if they are lost on death. This event will last until January 1st, at the same time that the Christmas Giveaway is removed. Make sure to complete it before then! Fixed some Ornament kits which were equippable. Beach boxing gloves are now tradable. Classics will no longer receive reduced GP from money caskets. 3rd Age has been removed from all Mystery boxes, but has been made slightly easier to obtain from Clue scrolls. A bug which would randomly pull an item from the next bank tab when you are withdrawing the final item in your current tab has been fixed. Hellish has been promoted to Event Manager. He will be assisting King purple with events during the week/weekend. Loo has returned to the Staff Team as Server Moderator. Elite Drew has returned to the Staff Team as Server Moderator. Iron Aritus has returned to the Staff Team as Server Moderator. Spanks has been promoted to Server Support. Elite dezrix has been promoted to Server Support. Effendi has been promoted to Server Support. Mhk has been promoted to Forum Moderator.  Sassafras has been promoted to Server Moderator. Eim 40a has returned to the team as Server Support. EIM 1gp has been promoted to Forum Moderator. EIM Django has been promoted to Server Support. Fe mag3 fe Has resigned from Server Moderator. Eim 40a has resigned from Server Support. Elite dezrix has resigned from Server Support. Lord Aizen has been demoted from Forum Moderator due to lack of activity. Effendi has been demoted from Server Support. Trade For GP has been demoted from Server Moderator due to lack of activity. Spanks has been demoted from Server Support due to lack of activity. This month I will be interviewing one of our Event Managers King purple and one of our Forum Moderators Paine! is there anything you would want to add or change to your current event list? King purple : Yes, I am working on a current NH Event similar to the one old school made for All Stars. It will take a lot of work with the +1 system Etc, but I am sure its possible to make it popular here on Alora. what other activities do you do on the weekend once those are completed? King purple : I tend to log off alora a bit, go out and take my mind a bit off the game so that i don't burn out. Either that or i just chill with my friends on voice and play other games ( Doesn't last long, i usually go back to alora in like a couple hours). Lowkey : You’ve been given an elephant. You can’t give it away or sell it. What would you do with the elephant? King purple : I Would take it with me to the US and see what ideas Trailer Park has. I'm sure me, Trailer park and the elephant would have a blast. Lowkey : Can you explain in detail why people call you "23"? King purple : Its the size of one of my body parts. I want to thank hsoJ for leaking that. Never saw someone so excited about knowing my neck size. Lowkey : As our final question, what are your plans for Alora/IRL in 2019? King purple : To make sure that my name keeps being mentioned by salty ex-staff and vets. I must be doing something right. Lowkey : What is your motivation to continue to play Alora and stay with the Staff Team? Paine : My main motivation to play Alora is the community for sure, just a very friendly place where you can have fun and chill. The reason I still stay in the staff team is because of all the friendships and bonds I've created with the other staff members. Oh and all the jokes about Lowkey's hairline. Lowkey : Was there ever a moment you wanted to quit Alora because you went 300m+ XP dry for an Agility pet? Also, what was your reaction irl when you received it? Paine : Well, I never had a moment where I wanted to quit because of it, but I definitely had breakdowns and stopped doing agility. It certainly was a hype moment when I got it, and I'm very happy because of it. Lowkey : If you had the chance to meet 1 person from the Staff Team, who would it be and why? Paine : If I had a chance to meet someone from the staff team, it would be Hellish. I enjoy talks with him (although I get flamed in every sentence), he's an awesome staff member and a great person overall. Lowkey : A penguin walks through that door right now wearing a sombrero. What does he say and why is he here? Paine : Buenos Dios amigos. Do you have any ice? Paine : My goal for Alora is to get as many pets as I can, but we all know how that ends. My IRL plans are to just chill, work from time to time and continue my studying as usual. 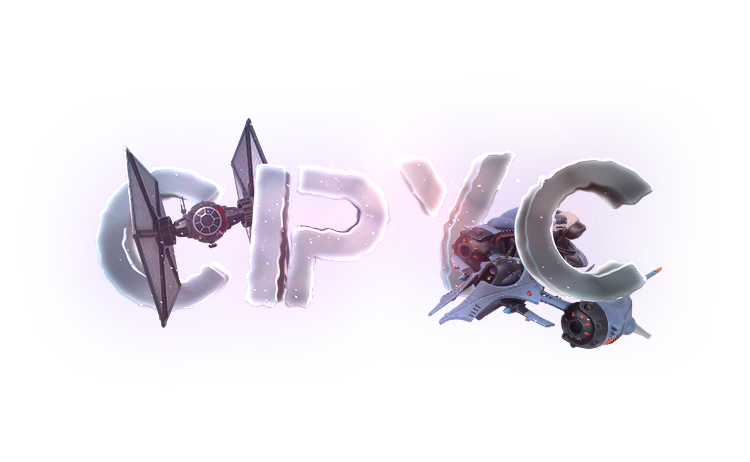 The December Community Awards are out now! So glad Helish got promoted to Event Manager to assist King Purple. Also, I didn't leak to everybody. I told @Dante and he told everybody. Thank you @Lowkey for the awesome newspaper! PS: PM me if you need any Alora hairline product, I'm a true merchant! Good read as always. Congratulations to ragragrag46 for winning MOTM. OT: Gz to everyone who were promoted this month once again keep grinding boys. Very good read, thanks for this months! Thanks for this month Lowkey, I had a good read. Always a good read, thanks for putting this together! Nice interviews as well, can gladly die now knowing what KP would do with an elephant. Very enjoyable read, congratulations on everyone who got promoted. Also congratulations to rag on MOTM . Loved the interviews as well. Can't wait to see what's in store for us in 2019. Great newspaper once again. This is one of the main things I look forward to each month. Good job! Congrats to ragragrag46 for MOTM, as well as the promotions. Sad to see some nice folks leave the staff team, but 2018 has been a great year for Alora, nonetheless. Great interviews as always, Lowkey! Amazing newspaper @Lowkey, a nice read from King purple and Paine. I like the newspaper @Lowkey, thank you! Cool interview with King Pringle and Paint too! Hellish is an amazing mod!